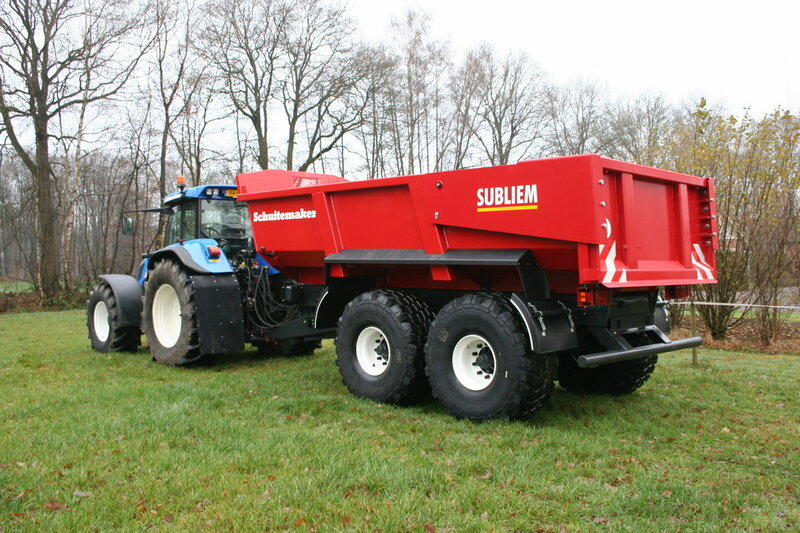 Zandkipper - Subliem | Schuitemaker Machines B.V.
On difficult and soggy terrain, a tractor with a tipping trailer is the best solution when it comes to transporting soil, debris and agricultural products. Where trucks get stuck in the mud, tractors with tipping trailers carry on. With speeds the modern tractors can reach, they often match other methods of transport on sealed roads. The Subliem sand tipper is a reliable, multifunctional tipping trailer, especially designed for transporting a large range of products and large volumes. Both the Subliem 200 (8.1 m3 capacity) and the Subliem 220 are fitted with 52-3 steel. The Subliem 200 has a 24-ton fixed tandem and the Subliem 220 has a 25-ton fixed tandem. 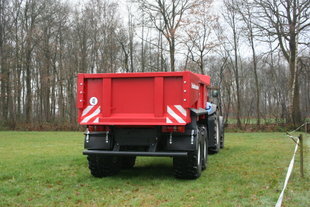 Both tipping trailers have a standard 550/60 R22.5 flotation band. Just like the Subliem 220, the Subliem 220 S has a capacity of 10.9 m3. 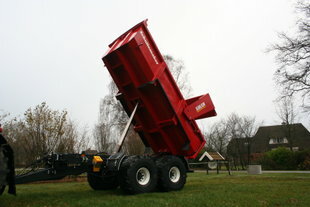 However, this tipping trailer is made with Hardox 400 steel. 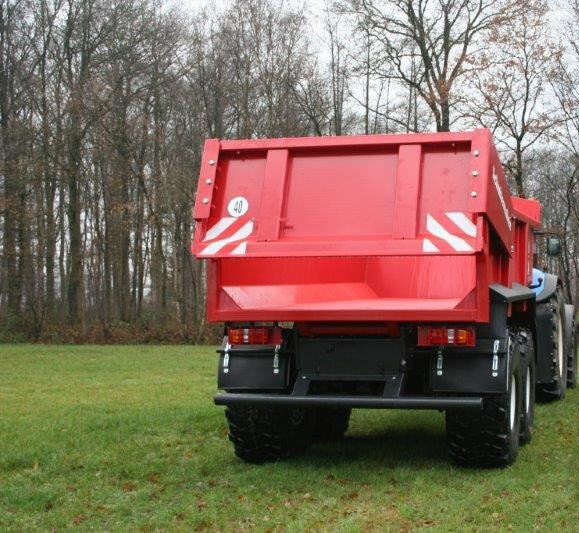 In addition, this tipping trailer comes standard with a 30-ton fixed tandem and 650/55 R26.5 tyres. 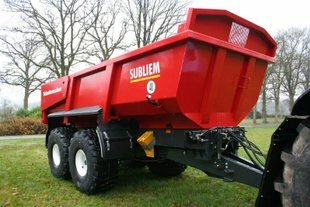 With a capacity of 12 m3, the Subliem 240 is the largest tipping trailer in the range. 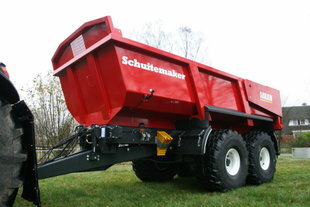 This tipping trailer is also made from Hardox 400 steel and, like the Subliem 220 S, it has a 30-ton fixed tandem. More information about the Subliem? Click here to learn more about the Subliem. The body can hold 8.1 m3 and has a 20-ton loading capacity. The body is a little bigger than the body of the Subliem 200, i.e. a volume of 10.9 m3 and a 20-ton loading capacity. This (sand) tipping trailer has the capacity of the Subliem 220. The body is made from Hardox 400 steel, which gives it 2 tons of extra loading capacity. The largest tipping trailer with 12 m3 body capacity and 24 tons of loading capacity; the body is also made from Hardox 400 steel.